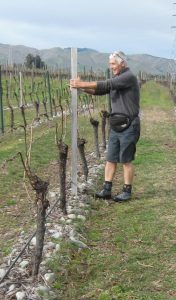 Stembridge Vineyard is managed under best practice ‘Sustainable Winegrowing NZ’ standards. Soils are described by owner Max Gifford as ‘mixed alluvial silt with gravel ridges’. Grapes are machine harvested and a Klimmer mechanical vine stripper is used followed by hand pruning. Two hundred and eighty eight E. bosistoana posts were purchased in July 2007. Max wanted to include the posts in his own trial of alternative vineyard posts. He installed 265 posts in rows immediately after purchase. Each post alternated with two plastic covered Greenspan steel posts. The unused posts were retained for replacements, and 15 were still in stock at the time of the vineyard visit. The balance of Stembridge Vineyards is installed with CCA-treated pine posts. Plastic posts have been tried and rejected. The total of 8 posts broken equates to 3% of the total of 275 installed 11 years ago. This indicates an annual breakage rate of 0.3%, compared to 5% in conventional CCA-treated pine posts. All but two of 50 posts assessed for in-ground decay showed less than 5mm of decay, even after 11 years in service. Max reported that, since installation, there had been ‘a small number of broken posts but no sign of failure from rot’. He commented that the posts compared ‘very well’ with the performance of other posts used in his vineyard which included half round CCA pine posts, steel, plastic and plastic coated steel posts. The typical causes for failure were breakage from ‘wind and machinery including harvester damage’. Positives mentioned by Max were ‘long life, uses after removed from vineyard, environmental’. Negatives mentioned were ‘very hard to nail and surface area could be larger’. Max said he would use the naturally durable posts again. He was not concerned that the posts were not certified as being sustainably produced. However, he did comment that ‘cost has to be taken into account. For example the plastic-coated steel posts were excellent but too expensive’. 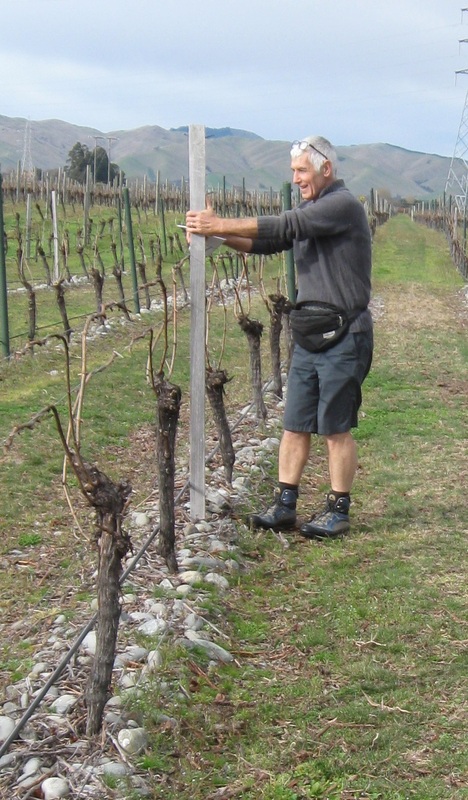 Vineyard owner Max Gifford testing the stability of a hardwood post.